Philippine Airlines recently adjusted it's schedule, adding some non-stop flights from Toronto to Manila, Philippines. It's just kind of an interesting one, more than a really amazing deal, as they are non-stop flights to Southeast Asia. They are priced about the same as the cheapest 1-stop flights from YYZ to Manila. 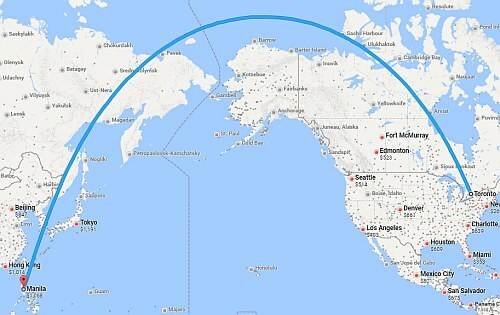 The flight from Toronto to Manila is 16.5 hours long, and are now the longest non-stop flights available from YYZ. You save about 3.5 hours of travel time versus the fastest 1 stop flights. - Toronto (YYZ) to Taipei, Taiwan (TPE) on EVA Air is 15.5 hours. - Toronto (YYZ) to Bombay, India (BOM) on Air Canada is 14.5 hours. Click on the departure date box to open up the calendar view and browse for other date combinations. toronto, yyz, flight deals, asia, southeast asia, manila, philippines and philippine airlines.